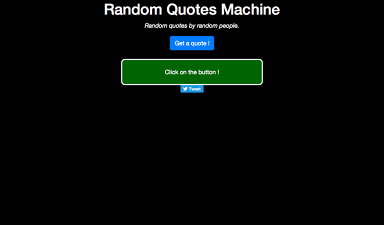 I’ve been working on the Random Quotes Generator and I can’t see to figure out how to reset the value of my span when generating another quote. I didn’t see anyone else on the forum with that problem. They just keep piling one after the other every time I click on my button. I didn’t think it was gonna hard to fix but I just can’t find a way to do it. I’m new to this so my code might seem retarded haha ! You can clear the containers first before calling insertAdjacentHTML with quoteContainer.innerHTML = '';. Or you can just use innerHTML instead of insertAdjacentHTML to output the quotes. I actually tried .innerHTML but i just realized i was doing .innerHTML(quoteString) instead of .innerHTML = quoteString…!